Cross is well known for it’s writing instruments lines, beginning with mechanical pencils. They are also the official supplier of pens to the White House and have been since the 1970’s. 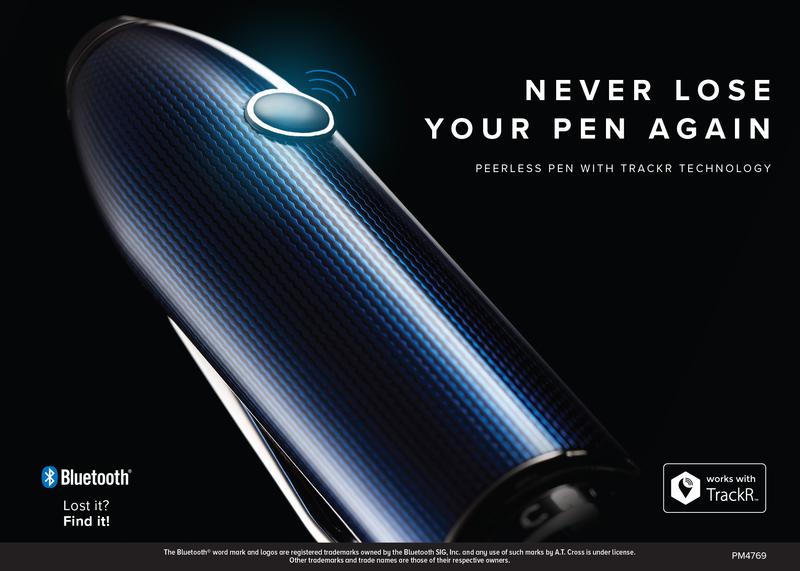 As a brand that has always championed greatness, it comes as no surprise of the development of the new CROSS Peerless TrackR pen. We all know how frustrating it is to lose a pen or a mobile phone with no way to find or track their location. The CROSS Peerless TrackR works when paired with the TrackR app. It then uses bluetooth and Crowd locate technology to keep people in touch with their devices on the move. If your pen falls out of your pocket or is left after or in a meeting any where in the world, the device can alert the owner of the last know location using the app. If the connection is lost from the paired phone, TrackR’s crowd locate community will automatically start searching for your pen using any one of the millions of TrackR app users device to track and update you of your pen’s last location. The pen can also help people find their misplaced mobile phones with a simple button press on the cap. The pen can alert people to their devices whearabouts, even when left in silent mode. The CROSS Peerless TrackR (RRP £215) and CROSS Pouch (RRP £35) will be available in April 2017 from all fine stationery stockists or at Cross.com/TrackR. TrackR was founded in 2009 to make lost items a thing of the past. The company’s app software, cloud databases and wireless devices revolutionize how consumers keep track of their items, thus creating a world where valuables are no longer lost.